PinkyPiggu: Goldleaf New Taiwan Porridge Restaurant @ Amoy Street ~ Best of Comforting, Endearing Classic Dishes! Goldleaf New Taiwan Porridge Restaurant @ Amoy Street ~ Best of Comforting, Endearing Classic Dishes! "You came all the way here specially to eat Taiwan porridge? It must be good right? ", the taxi uncle asked me as he dropped me off at my destination, Goldleaf New Taiwan Porridge Restaurant at Amoy Street. I couldn't answer him in certainty back then as it was my first visit to the restaurant. Now, as I write in retrospective, my answer would be a resounding "Yes!". My meal at this seemingly humble establishment is more than good! It's awesome! My initial impression of Goldleaf as I stepped into the spacious interior, was of its homey simplicity that was instantly welcoming. The above shot of the restaurant may be misleading as it was taken after the lunch crowd left but the scene earlier was of contrasting difference with almost every table filled. My point? The place is popular so do call and make reservations. I left the ordering in the good hands of my dining companions and Karen, who is the daughter-in-law of Goldleaf's founders. Soon, the dishes were brought out in quick succession, the start of a scrumptious Taiwanese porridge feast is about to take place! But first thing first, for those of you who are health conscious, I'm pleased to declare that the food served at Goldleaf contains no MSG. The starter which is served to all tables was an indication of the rest of the goodness that was about to follow. Not your run-of-the-mill pickles or pre-packed salted peanuts, Goldleaf takes the effort to freshly prepare Braised Firm Beancurd with Soft Peanuts from their kitchen. The small dish looked unassuming, but is surprisingly big on lip-smacking flavors. What used to be complimentary is now chargeable (makes better economic sense) because the appetizer is so popular that repeated servings are a norm. This alone is darn good with spoonfuls of porridge. Laugh if you want, but I'm one of those who sometimes order "laksa mai hum". Somehow I couldn't warm up to the taste of raw cockles, but my aversion did not deter me from trying the Fresh Cockles with Special Sauce ($10), since the table of fellow food lovers were raving about it. The initial crunchy bite which gave way to bouncy flesh and bursts of freshness with each subsequent chew, astounded me. Mild spiciness from the accompanying dip gave it a welcoming touch. Though I can't say I'm a converted fan, but the experience was definitely a positive one. I jokingly commented that the plate of deep-fried fish looked like giant ikan bilis (anchovies) when I was told in all seriousness that this is Crispy Tamban Fish ($10). Its fragrant shattery crunch coupled with special sauce and sprinkles of sesame seed not only makes it a wonderful dish with porridge, but also an excellent snack to munch on along with glasses of beer. Another dish which was executed to excellence was the signature Prawn Roll ($8/$12). All ingredients are fresh and meticulously hand-chopped, wrapped in salted beancurd sheets before being deep-fried to a layer of crispiness on the outside, yet remaining moist on the inside. The prawn and meat fillings come together not too densely, with generous bits of crunchy water chestnuts which was particularly delightful. Waves of home-cooked taste hit the my palate as I relished in Steamed Minced Pork with Salted Fish ($8) and Steamed Minced Pork with Salted Egg Yolk ($8). I like salted egg yolk with everything, but I don't think I'm being biased when I say it's one of the most delectable classic dishes to go with porridge. 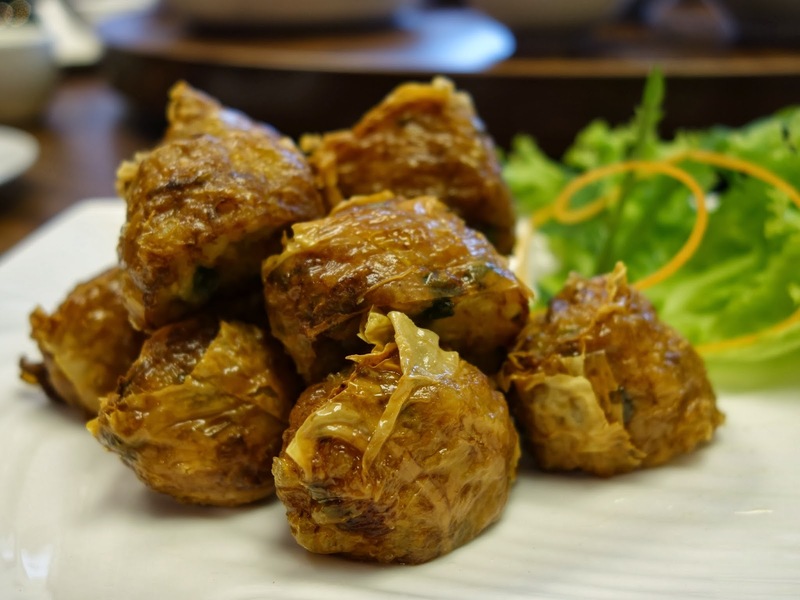 While the flavor of the salted fish version can be more pronounced, the soft minced meat patty with a well-proportioned mix of lean and fatty pork made up for it. The level of saltiness for the light soya sauce seasoning suits me just nicely. It is often said that the simplest dishes are the hardest to execute to perfection. I feel that humble staple dishes such as Chye Poh Omelette ($10) are a true test of a chef's ability, and Goldleaf can safely say that their chefs passed with flying colors! The eggs were evenly-beaten and pan-fried into a neatly round shape, its center was amazing soft and fluffy, but spread out to golden brown crisp edges. Together with preserved radish which were not too finely-chopped thus retaining a nice bite, the whole combination of textures was gorgeous. Taste of the preserved radish was not too salty and brought out the fragrance of the egg really well. Truly an epitome of an endearing classic which is well-loved throughout the generations. 3-Cup Chicken with Basil ($14/$18) is another traditional favorite. 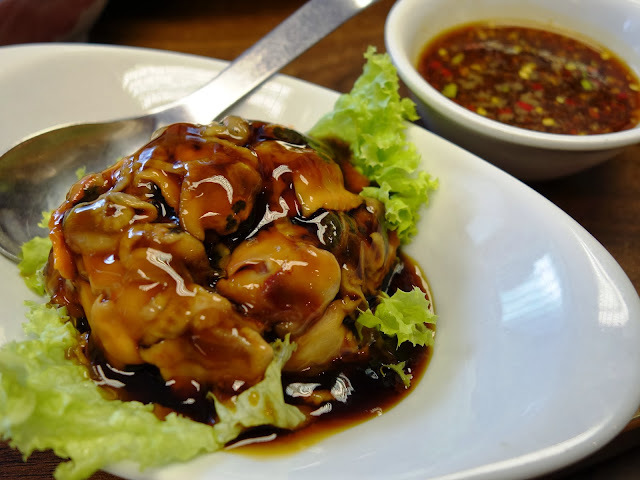 Authentic recipes will call for a cup of of soya sauce, sesame oil and Chinese wine each to make up the gravy which gave the pieces of succulent chicken a luscious coat of deliciousness. The unique mint-like scent of sweet basil further binds the tastebud to this flavorsome delight. The best hearts-winning dish award went to the deserving Braised Pork Belly with Preserved Vegetables ($16)! Grace, the daughter of Goldleaf's founders and who now holds the reins in the operations, spares no efforts in having her due diligence on pork belly done, before procuring her meat from a carefully selected supplier. The right cut makes all the difference, as evidently shown in the plate of savory melting tenderness which held our whole table of discerning palates, spellbound. The preserved mustard greens was not overly salty, and had a slight crunchiness to each bite, totally unlike those limpness pedestrian versions. These two star ingredients complemented each other flawlessly! Unquestionably a winner! Cod Fish with Specialty Sauce ($11/100g) is another delectable dish boasting of premium Norwegian Atlantic cod fried to a crisp on the outside, yet a gentle nudge with the spoon revealed the delicate white flesh within. We didn't forget to have some greens too. Taiwan Lettuce (Er Chye) ($10/$12), sauteed with garlic and wolfberries, was refreshing while the French Beans with Minced Meat & Shrimps ($10/$12) took on a slightly heavier note. The latter went extremely well with Sweet Potato Porridge ($2 per pax, free flow), which was so good, I succumbed to more than one bowl. Its consistency belong to the type I'm fond of, past the watery stage with grains just broken, but not gooey like congee yet. Getting the tummy space filled with this porridge was worth the carbs. Goldleaf had given their rendition of Homemade Yam Paste with Gingko Nut a much lighter handling compared to the old-school versions I had elsewhere. Purists might be disappointed to find the quintessential drizzle of lard missing, but I can assure the dessert is just as enjoyable without it. Its texture was velvety smooth and easy on the throat, sufficiently sweet without being cloying. I finished the bowl of yam paste effortlessly even after the full meal, with none of that uncomfortable surfeit guiltiness at all. The dining experience at Goldleaf was chock full of heartwarming deliciousness. More often than not, the younger generation get caught up in pursuit of the latest cafes or food fad, without realizing there's a lot of traditional gems to be re-discovered too. I applaud Grace and Karen for their efforts to stay connected with the evolving times through social media channels and blogger engagements to reach out to this group of youngsters, while maintaining what Goldleaf does best: Dishing out comforting, endearing classics for all generations. Their willingness to takeover the family business and continuing to spread their part of food culture which had been painstakingly established for 40 over years since 1971, is commendable. Thanks to Grace and Karen of Goldleaf for their warm hospitality. Enjoyed reading your post very much :D Carefully crafted with good details and yet easy to read :D I am going to bring my friends there for our next get together. I am sure they will appreciate the goodness at Goldleaf too. Thanks! I also find that the braised pork belly is a winner. Missing it!